Matrix Walkway panels are plastic gratings injection moulded in one piece from UV-stabilised polypropylene, one of the most durable polymers, to ensure many years of maintenance free outdoor life. They are completely impervious to insects, fresh and salt water and most chemicals, and will not rot, rust or mildew. 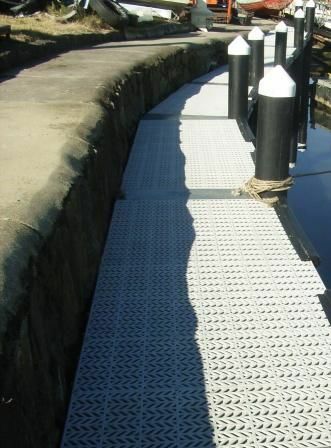 Each Walkway Panel covers an area of 1.2x0.4m (0.48m2 of top surface area or 0.49m2 including expansion gaps). They are available in new polypropylene resin in Beige and Light Grey colours and in recycled polypropylene resin in Dark Green and Black colours. 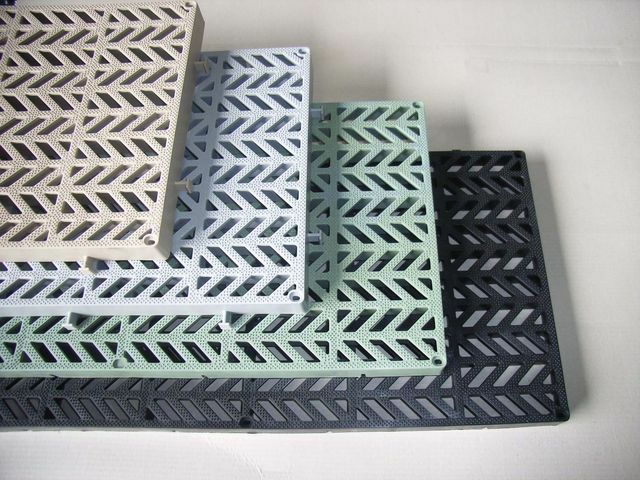 Custom colours can be manufactured to special order - minimum order quantity is 500 units per colour. Note: The colours shown may not exactly match the colour of the actual product and should be used as a guide only. 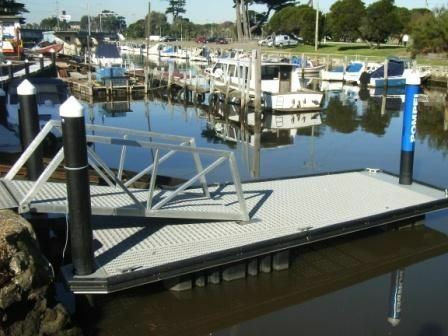 Matrix Walkway Panels are light and strong, and have been tested to Australian Standards under both Uniformly Distributed Load and Concentrated Load. We have conservatively applied to the Matrix Walkway Panels Safe Working Load ratings of 5kPa under a Uniformly Distributed Load and 4.5kN under a Concentrated Load. Test report is available - please contact us for a PDF copy. 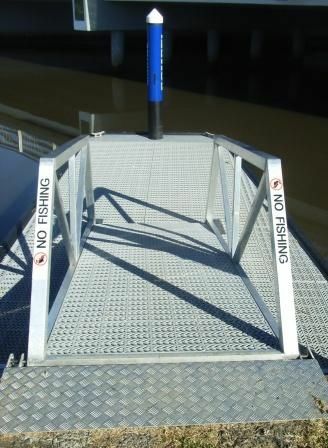 Thousands of raised bumps cover the entire top surface to prevent slip even when wet or barefoot. Matrix Walkway panels have been tested to all applicable slip resistance standards - see brochure for test results. Click here to download the PDF file that explains slip resistance ratings. Matrix Walkway panels can be used wherever you need a light weight strong floor that allows through water, air and light, especially in environmentally sensitive areas. They clip together in either direction to make installation easy, and are then attached to the supporting structure with screws through moulded-in screw slots, which allow for thermal expansion and contraction. They can also be used either laid directly on the ground or supported on plastic pads for easier cleaning. Please check applicable regulations to confirm their suitability before using them in your application.